Mega Bollywood hit film Dabangg has set a record as the biggest grosser in the Hindi Cinema. The film is now going to be remade in Telugu with Power Star Pawan Kalyan in the lead role. Power Star himself is producing the film on Creative Works Banner. This is his first film as producer. 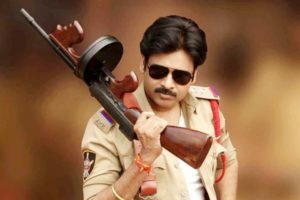 It is titled as Gabbar Singh and will be directed by Harish Shankar (director of Mirapakai and Shock). Shooting is expected to begin shortly. Speaking about his first production Pawan Kalyan said This is the first film coming under our banner. I will be playing the role of Gabbar Singh in it. Director Harish Shankar narrated several scripts in the past but due to some unavoidable reasons I couldnt do a film with him. Now, I strongly believe that he is the right person to remake Dabangg. Details of other cast and crew will be announced soon.